The Celebrate Urban Birds project at Cornell Lab of Ornithology wants to know how birds survive winter in your neighborhood and invites you to participate in the Survival Challenge. Your entries could garner you one of various prizes, such as a binocular, a birdfeeder, a birdsong calendar, a book or greeting cards. 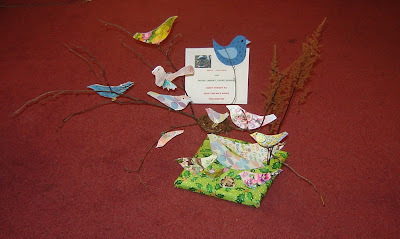 Take a photo, create some artwork, shoot video, write a story or a poem, or create a sculpture. Get creative! Just show how birds get along in winter in your community. It could be a place, a behavior, a human-bird relationship, or anything you can spot! Nova Scotia’s climate boasts robust winters and lavish snowfalls. 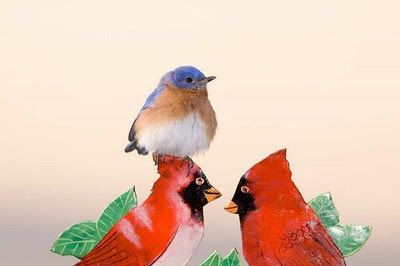 * Email your photo, art, or video entry to urbanbirds@cornell.edu. Links are acceptable for videos. * Write "Survival_YourFirstName_LastName_YourState/Country" in the subject line. * Include your name and mailing address in the email. * Tell us why you submitted the entry to the Survival contest. What’s the story behind your image? * Agree to the Release of your entry for Cornell's future use. By entering, you agree that you are granting the Cornell Lab of Ornithology a royalty-free, perpetual license to use the images or video for any purpose, including but not limited to publications, websites, and commercial products benefiting our education, outreach, and research programs. Send your entry before Feb. 15! Each year, Action For Nature recognizes young people ages 8-16 who personally improved the environment significantly. With the International Young Eco-Hero Awards, the international nonprofit organizations awards cash prizes of up to $500 to the winners who've created progress in environmental advocacy, environmental health, research or protection of the natural world. The guidelines appear here, and the application is available here. The application deadline is Sunday, Feb. 28. Please share the details with birding youth! Bolsa Chica Ecological Reserve in Huntington Beach, Calif., stands out as prime wetlands for birding. Birders from around the country stop by the wetlands along PCH while in Southern California. I've had the pleasure of seeing Long-billed Curlews and other fine species there with Mike Bergin of 10,000 Birds while a business trip brought him to my stomping grounds. 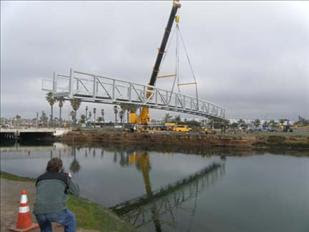 The long-awaited Bolsa Chica footbridge to connect the North Parking Lot with the Bolsa Chica Mesa finally arrived about 9 p.m. on January 12 after a long, slow journey from its manufacturing origin in Arizona. The 145-foot-long structure was fabricated of high-strength tubular steel and weighed about 70,000 lbs. It will be considerably heavier when its concrete floor and other structures are added in the coming weeks. Only then, following a ribbon cutting ceremony, will it be open to the public. About 60 onlookers stood in a light drizzle on the morning of the 13th to witness the installation of the bridge onto its concrete footings. Once in use, the bridge will eliminate the need for visitors to Bolsa Chica to use the bicycle lane on Warner Avenue, inches from heavy, fast-moving traffic, to get to the mesa. Show your love for birds during Valentine's Day weekend by participating in the Great Backyard Bird Count! The citizen-science project involves as little as 15 minutes on one day or as many minutes as you like on Feb. 12th through 15th. Organized by Cornell Lab of Ornithology, National Audubon Society and Bird Studies Canada, the 13th annual free event entails counting birds in your back yard or at local parks or refuges. Then you just fill in an online checklist of observed species and their numbers. Scientists and bird enthusiasts can learn a lot by knowing where the birds are. 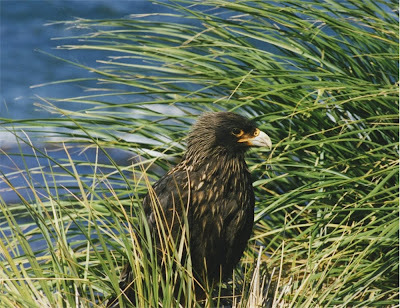 Bird populations are dynamic; they are constantly in flux. No single scientist or team of scientists could hope to document the complex distribution and movements of so many species in such a short time. If you take pictures of the birds during the Great Backyard Bird Count, consider entering them in the photo contest. You might win one of many prizes! American Birding Association recently launched an effort to help enthusiastic birders share the organization's mission with like-minded folks. The ABA Ambassador Program seeks volunteers initially from certain provinces, states and regions: British Columbia, Oregon & Washington, Northern California, Southern California, Arizona, Texas, Northern Great Plains (ND, SD & eastern MT), Arkansas & Louisiana, Illinois & Indiana, Eastern Highlands & Upper Ohio River Valley (OH, WV & PA), Florida, Southern Atlantic (GA, SC & NC), Middle Atlantic (VA, MD & DC), Hudson-Delaware (NY, NJ & DE) and New England (ME, NH, VT, MA, CT & RI). With the Ambassador program, ABA is reaching back to our beginning as a grassroots organization for birders. Many members are passionate about ABA and are already serving as Ambassadors in many meaningful ways. We want to give them the tools to effectively educate and inspire people to enjoy and protect wild birds. The program will be launched in stages with Ambassadors chosen by geographic regions of greatest need through an application and reference process. The idea is to deputize qualified volunteers to represent ABA at local bird festivals, bird clubs, state ornithology meetings, etc., and to lead bird walks and mentor young birders in the name of ABA, YOUR membership organization for birders. ABA will initially provide logowear, name tags, business cards, and a portable display and will support the Ambassadors’ outreach efforts by shipping collateral materials, including brochures and sample publications, to each Ambassador as needed. We hope that interested parties are willing to donate their time and travel expenses in the beginning, with the understanding that festival booth fees and the like will be paid for or reimbursed by ABA. As the program grows and shows promise, we hope more compensation will be possible. Contact Chip Clouse with questions. Harley, now a healthy Bald Eagle, will regain his freedom this Saturday at Carpenter St. Croix Valley Nature Center in Hastings, Minn. When he flies away at noon, he'll sport a satellite transmitter that will let University of Minnesota's The Raptor Center track his movements. Six months ago, Harley arrived at Lake Superior Zoo in Duluth via motorcycle. A motorcyclist found the injured raptor near Wascott, Wis.; wrapped the big bird in his leather jacket; and strapped him to the back of the motorcycle. From the zoo, the eagle went to The Raptor Center at the University of Minnesota College of Veterinary Medicine on the St. Paul campus. Center staff diagnosed a fractured wing and lead poisoning, likely caused by eating prey shot with lead ammunition. The public is invited to the free event, located at 12805 St. Croix Trail in Hastings -- on County Road 21 (St. Croix Trail) north of Highway 10. For more details, call The Raptor Center at 612-624-4745. Ready to spend some quality time with your computer and birds from around the world? Settle in for a wonderful session with the Birds section of National Geographic's animal videos. You'll find different groups and multiple videos within each group. For instance, the Birds of Prey menu offers 20 videos including California Condors in Arizona and Bat Falcons in Guatemala (be prepared to see a bat consumed). Want to chuckle? Watch the "Flying Devils" video of Striated Caracaras destroying the NatGeo videographers' campsite -- and then two adult STCAs show dominance over some juveniles. Whoa. The selection includes Ground Birds (three), Parrots and Hummingbirds (five), Penguins (five), Perching Birds (nine), Seabirds (12), Waders and Waterfowl (17) and Woodpeckers (three). The U.S. 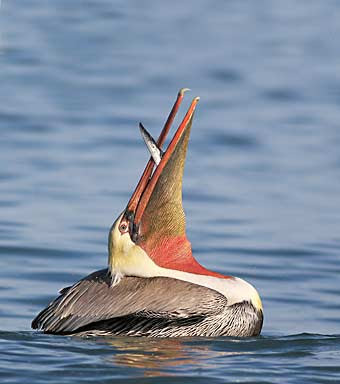 Fish and Wildlife Service (Service) has been receiving calls about Brown Pelicans that are either washing up dead on the [Oregon] coast or are exhibiting behavior which is uncharacteristic for the species (ie. begging for food, no fear of humans, eating bread crumbs as handouts). Many of the birds are emaciated or starving, and this is the reason for their seeming lack of fear of humans. California Brown Pelicans are protected under the Migratory Bird Treaty Act. Thus it is against the law to capture, kill, or possess these birds. Anyone found in violation of this law could face penalties of up to $15,000 in fines and/or 6 months imprisonment for each violation. If you have information of anyone violating the Migratory Bird Treaty Act please fill in the violation report form or call your local U.S. Fish and Wildlife Service Special Agent. Finally, please DO NOT feed these birds. This will only lead to further habituation of these birds to handouts from humans. It is important that these birds continue on their migratory route. Tomorrow's the last day to submit your contribution to this week's edition of I and the Bird, the biweekly birding carnival. Send the hyperlink and a description of your preferred post to hostess Seabrooke at sanderling AT symbiotic DOT ca. Don't miss this chance to bring more eyes to your blog! Tune into the Marvelous in Nature on Thursday for this week's edition of the blogging roundup. 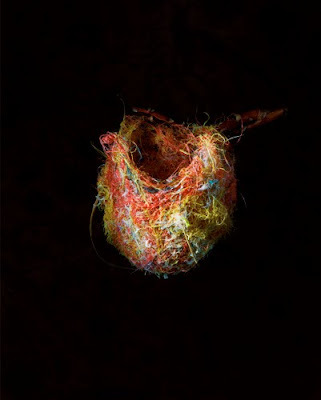 Recent exhibitions include Phylum and Refuge, which looked at the hybrid architecture of a collection of bird nests constructed of materials we humans throw away. In this borrowing process the detritus of our lives: Christmas tinsel, hair, dental floss, etc., become the building materials for birds. 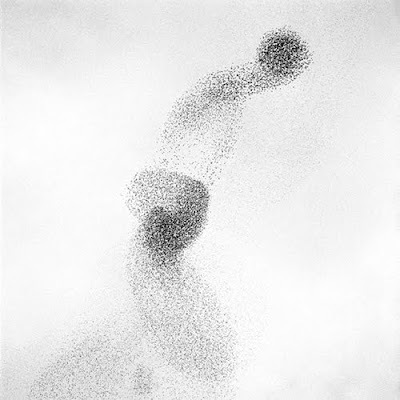 The nests hover ambiguously, between the natural and the artificial. An exhibition titled Murmur followed those images. In 11 images here, Barnes shows the beauty of aerial flocks. Jonathan Rosen, author of "The Life of the Skies: Birding at end of nature" (2008), wrote about Barnes' work and birds' flight patterns here. In Europe, where the birds are native — Mozart had a pet starling that could sing a few bars of his piano concerto in G major — they still have the power to turn heads. Each fall and winter, vast flocks gather in Rome. They spend the day foraging in the surrounding countryside but return each evening to roost. (Rachel Carson, author of “Silent Spring,” called the birds reverse commuters.) They put on breathtaking aerial displays above the city, banking in nervous unison, responding like a school of fish to each tremor inside the group. Maybe you haven't heard of Bill Bailey. We need to remedy that pronto. 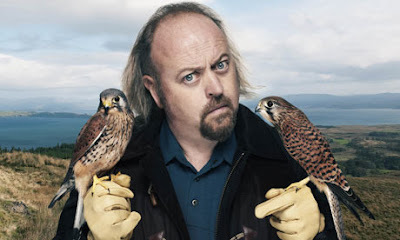 Listen to the 4:30 audio clip at this Guardian article, and learn about Bailey's history as a birder/twitcher as well as his new TV show, "Bill Bailey's Big Birdwatching Bonanza." You'll find a very amusing, quick video at the second link, as behooves a fellow known for his comedic talents. Congratulations to Seabrooke Leckie of The Marvelous in Nature! She earned top honors in the one and only Third Friday fiction contest. By crafting an intriguing 500-word tale, Seabrooke earned the chance to receive a recently published birding book of her choice. No doubt the book will provide good reading fodder. Please participate in the February contest! 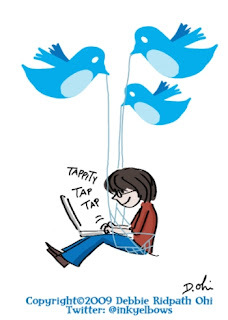 Mark Feb. 4 as the deadline for your fictional story about birds, birders or birding. * The story includes four elements: a setting, a character or characters, a conflict and a resolution. * The story does not anthropomorphize birds. It was late in the afternoon, the sun already grazing the tops of the trees on the western horizon, its low rays giving the small hummocks of snow a rosy blush while casting blue shadows behind them. It had been a long day of hiking, and Steve was ready to put his feet up over a warm dinner and hot mug of hot chocolate. They had been lucky today with the weather; he had participated in some Christmas Bird Counts in the past where it was minus twenty with blustery snow. He unlocked his car, setting his notebook and binoculars on the seat as he unwrapped his scarf. He was satisfied with the day. They’d got some good birds along the way, including a handful of crossbills, and a yellowthroat found skulking around in the shrubs of a small marsh, a record late for their county. They had recorded 49 species, which tied his personal high in the 14 years he’d been doing the counts. He patted down his pockets, looking for his keys. Something was missing. He paused, realization dawning that his GPS was missing. Oh, man. It had been a gift from his wife; he’d been so excited to try it out today. He’d had it when he arrived here; he’d marked the location of a Hermit Thrush with it. He looked back toward the woods with a sigh. Nothing for it but to retrace his steps, he supposed. That would make him late for the count dinner and compilation, but folks would understand. He bundled up his scarf again and collected his binoculars, then trudged back out along the trail he’d returned by. He watched the ground carefully, looking for anything foreign-looking, or pockets of snow that might suggest something had fallen. He vaguely recalled having pulled out a granola bar at one point. Perhaps he’d dropped it then. He’d walked back nearly twenty minutes along his trail before he finally spotted it, lying half-buried in the snow where the boot prints suggested he’d paused to look at something. He reached down and picked it up, brushing the snow from the device with a glove. It seemed okay. It was supposed to be waterproof, anyhow. He looked up as he tucked it in his pocket, and with a shock found himself staring into two very deep, black eyes. The eyes belonged to a fat Barred Owl, which regarded him curiously, sleepily. It was roosting unusually low, but seemed healthy. Steve dared not move, and barely breathed as he looked at the owl and it regarded him. Finally, reluctantly, he tore himself away; the sun was nearly set, and he had a dinner to attend. He glanced over his shoulder as he left. The owl was watching him go. “Hoo-hoo hoo hoo-aah,” Steve hooted at the bird. The bird puffed out its throat feathers. “Hoo-hoo hoo-hoo!” It responded. Steve smiled, then turned to head back to the car. Number 50, the record-breaker. And what a memorable one! Do birds depend on birdfeeders? "Once you start to feeding in winter, you need to keep it up," said John O'Neill, a naturalist at the Little Red Schoolhouse Nature Center in Willow Springs. "The birds start to depend on the food and it could be detrimental if you suddenly stop." The birds depend on birdfeeders, and we could hurt them if we stop filling the feeders? I've heard otherwise. This article at Kingston Field Naturalists appears to indicate otherwise. Brittingham, in a study on the winter feeding habits of the Black-capped Chickadee in Wisconsin, showed that birds obtained 20 to 25 percent of their daily energy requirements from feeders, and an additional 75 to 80 percent from natural (wild) food sources. 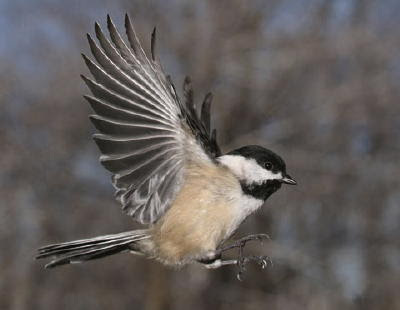 Her study also showed that in normal winters chickadees that used feeders as a supplemental food source survived at the same rate when feeding station food was removed as did chickadees that had never been exposed to feeder food. That article refers to a 1983-1985 study by Margaret C. Brittingham and Stanley Temple. Have you read other research that focuses on how much wild birds use birdfeeders? In November, we revived the First Friday birding fiction contest and enjoyed the wordsmithery of Clare Kines. A repeat winner, Clare sets high standards. You can read his November entry here. For the January contest, we're going to fudge the timing a wee bit. The first Friday was Jan. 1, a holiday! The second Friday entails a business trip that will keep me on my toes in Atlanta, Ga., so the third Friday -- Jan. 15 -- will bring a well-crafted story for your enjoyment. * The story contains 500 words. That's all: 500. * It deals with birds, birders and/or birding. * It includes four elements: a setting, a character or characters, a conflict and a resolution. * You send your wordsmithery to wildbirdATbowtieinc.com before 5 p.m. PST on Thursday, and you include your mailing address. Some birders think they lack the imagination or writing chops to create a good story. I think otherwise! Many writers use a real-life incident as the spark for a tale. Maybe while you participated in a Christmas Bird Count, you experienced a sight, sound, smell, touch or taste that's perfect for a 500-word imaginary incident about birds, birders or birding. Please do join the fun! 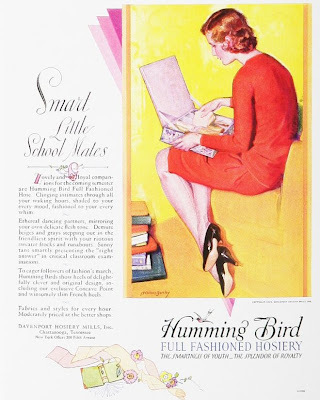 Davenport Hosiery Mills in Chattanooga, Tenn., made Humming Bird hosiery, and the company made the first nylon hose in 1939. It's January, so it's time for the birding industry to flock together in Atlanta, Ga., for the annual trade show. Not only do I get to catch up with wonderful colleagues, I get to talk with new-to-me retailers and manufacturers while tending the WildBird booth. 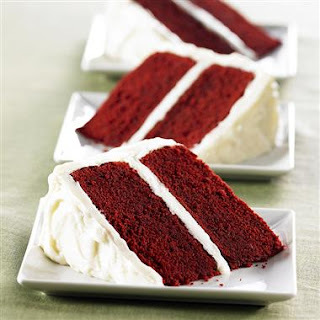 Friday and Saturday will be full of good gabbing -- and, I hope, a chance to eat red velvet cake. I also get to spend time with Sharon Stiteler, aka Birdchick. You can look forward to seeing and reading her observations about Birdwatch America and AmericasMart. Familiar with the biweekly birding carnival, I and the Bird? The previous edition, crafted quite well by Jason, appeared on Dec. 17. Tomorrow -- Jan. 5 -- marks the deadline for the next edition, slated for an appearance at Listening Earth Blog on this Thursday. I'm stymied, though, by not finding an e-mail address to which contributions can be sent. Does anyone know what it is?